Our hours are 10-6, Monday through Friday and 10-5 on Saturday. Closed Sunday. Also available by appointment. 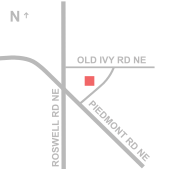 We are located in the Powers Ferry Square on the corner of Roswell Road and Powers Ferry Road. We serve Buckhead and the surrounding areas.